What isn't grammar study good for? I started learning Polish by taking a course at the university. We spent all our time learning and practicing grammar rules. I always did well and got very good grades on the tests. Conscious study of grammar won't help you become proficient in a language, because language learning is an unconscious skill. It wasn't until I started actually using Polish (by reading and listening to books) that I began to really speak Polish. Now I can't even remember the grammar rules! I still make lots of mistakes but I speak a lot more grammatically than I did when I knew them well. So, what is grammar good for? Grammar can be a useful tool in some very specific situations! As adults, it is very hard to accept things without questioning. We need to know why! Why do I say, "lubię filmy" (I like movies) but "interesuję się filmami" (I'm interested in movies?)? Honestly, you don't need to know why. With this word you say it like this and with another you say it like that. Just accept it! That's what children do when they learn a language. But adults have problems with this. They need an answer and the grammar rules can provide one. So read them when it bothers you, get your piece of mind and move on! Languages are made up of patterns. If you don't know anything about the language's grammar, it will be hard to know what to look for. You don't need to memorize any rules or take any tests, but just a quick overview of the grammar (like I made for Polish) can be very helpful. As you learn the language better, occasionally take a look in a grammar book. It might help you recognize a pattern you've seen for a while but didn't quite pick up! Grammar rules are very difficult to apply when speaking or listening to fluid speech. It happens too fast for conscious thought! When you are writing, you have plenty of time to think. Knowing the grammar rules can help you correct mistakes in your writing which will make you seem smarter and more educated. Features of a given language are always naturally learned in a predictable order (called the order of acquisition). For example, English speaking children always learn to use the present progressing tense (-ing verbs) correctly before the plural of nouns. 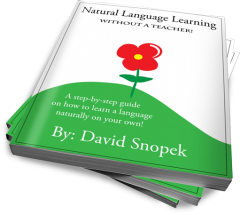 If you haven't learned a particular language feature naturally yet, you can use the grammar rules to fake it! This is very difficult to do in fluid speech and you might not be able to skip ten steps further than your unconscious language skill. But you might be able to do skip one or two. What do you think? Is conscious study of grammar sometimes useful? Is it never useful? Or am I crazy and we should all be studying grammar every day? Write a comment a below! This is one of the most concise treatises on the necessity of grammar study (or lack thereof!) I've read to date. I was wondering if you would mind me re-posting it on my website with links back to your site? Regards from currently sunny San Diego! I believe what especially matters in effective teaching and learning of English grammar is how clearly and easily understandable all grammar rules are explained and whether adequate supportive exercises with real life content are practised to master that material. It would take foreign learners much less time to learn grammar rules that are explained to learners than to figure out grammar rules on their own based on even numerous grammatical usage examples because grammar rules may have exceptions and other peculiarities. Without adequate knowledge of English grammar rules learners often cannot create their own grammatically correct sentences and often cannot understand what they read or hear in English exactly. Grammar books with explanations and exercises have been published by knowledgeable language specialists to make learning grammar easier so that learners don't have to discover grammar rules anew the hard long way. Learners can learn grammar and practice it in communicative grammar exercises with real life content (with sentences that most likely can be used in real life situations). I prefer English courses that include (integrate) grammar material in thematic conversation and vocabulary practice activities (exercises) in each lesson. English, Complete Edition (by Living Language) is a unique multimedia program that is designed for speakers of any language. It takes a learner from a beginner to an advanced level in one convenient package. It is a beginner through advanced course, including coursebooks, audio CDs, and online learning. Learners of English for example should be encouraged to make up their own sentences on each grammar point taking into consideration their personal daily life activities (thus using English grammar for their potential relevant needs in realistic situations). Imagination and creativity play a major role in this practice as learners prepare for potential use of English grammar for their needs. there are some specific fields of grammar which, I believe, should be studied because it is difficult to recognize what some concrete grammar constructions could mean otherwise. For example Present Perfect is rather artificial tense to Polish mind (at least in the beginning) and I doubt that people will manage to figure out what is that construction for correctly. And construction of conditional tenses is different in English and Polish so it is good to know it before you start to read books in order not to absorb the wrong image of what it could mean. But you shouldn't bother your head with grammar too much. Just look through the book to get feeling what are the things to which you should pay attention. But I have mentioned conditionals above. "If it rains, I will go home". - Jeżeli BĘDZIE padać, pójdę do domu. (Note that in Polish translation both subsentences are in Future Tense). How to translate the above sentence from C++ to English? I hope that you understand what I mean :). Jeżeli pada, to pójdę do domu. BTW, English grammar has a very pleasant property - the huge portion of it can be described in a single (Polish) book. I agree that people should occasionally look over the rules for grammar, but not worry too much about them in practice. In English, "If it rains, I'll go home" is actually in the present tense. However, we can use the present tense to refer to the future as well! For example: "On Saturday I'm going to Chicago." (which is true, BTW!) But right now, it's not Saturday - it's Monday. I could also say "On Saturday, I will go to Chicago" - both are correct, but (if we choose) we can talk about the future in the present tense in English. 1. Jeżeli będzie padać, pójdę do domu. 2. Jeżeli pada, to pójdę do domu. Thank you very much, it helped a lot. "If it rains now, I will go home".